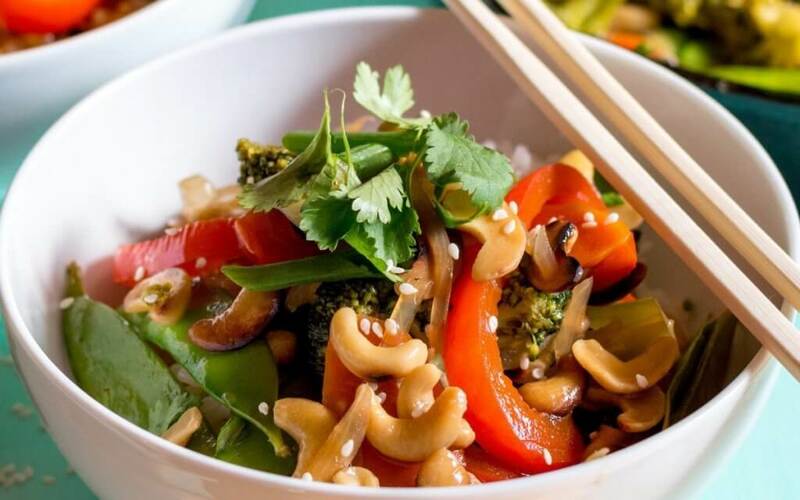 You have to try this vegan recipes like the toasted cashew stir fry, it does not only look delicious, it is a delight to eat it.But not only the Stir fry is a must try, here are more awesome vegan recipes , like Vegan Enchiladas, Chickpea, Quinoa and Tumeric Curry, Kung Pao Lentils and more. Does this sound good ?All the recipes are from Ladiesn who inspire us to cook healthy ,egg-free, dairy-free meals which are easy to prepare.Some of them had their journey from health issues to plant-based food and are dedicated to help others to eat healthy too. See these recipes below and get started. Everybody needs a go-to recipe for those busy days and this stir-fry is the perfect candidate. Broccoli, carrot, red bell pepper, and other vegetables are stir-fried in coconut oil with toasted cashews until tender. They’re coated in a thick, sticky sauce that’s spicy, sweet, and gingery. Making this dish takes only a moment of your time before it’s time to dig in! Kelp caviar and avocado wontons sound so awesome… if we could just overcome the hurdle of learning to make them. Many vegan recipes just sound so time-consuming. It’s not easy to cook great-tasting meals that exclude meat, eggs, dairy products and all other animal-derived ingredients. Luckily, there are a handful of bloggers out there who make vegan cooking look easy peasy.